High quality hay is a scarce commodity in NW Florida. 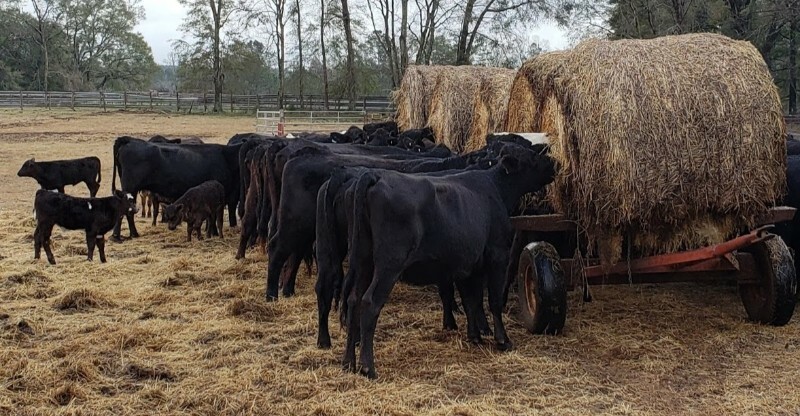 Feeding poor quality hay necessitates additional supplementation to keep cows in a sufficient Body Condition Score to maintain reproductive efficiency. As a County Agent, when I travel to meetings and other events I often hear the same question; “How are things in Washington County?” One of my go-to responses is “Plugging along.” While I may generally over use the phrase, right now I feel like it accurately describes the situation and mood of most beef producers in Northwest Florida and the surrounding region. I didn’t point out all these negatives to discourage you; on the contrary I want to remind you that eventually things will green up, it will dry out, fences will be fixed, and the ranch will go on. So, while you’re plugging along, getting through these rough times, don’t lose sight of the big picture. Remember the management decisions you make now will affect your operation for years to come. As you’re plugging along, please don’t forget that nutritional management and reproductive efficiency are inseparable. In other words, if you let her get too skinny, she won’t breed back. Reproductive efficiency is the characteristic of a cow herd that has the greatest effect on financial viability. Providing adequate nutrition to the cow herd is challenging right now, but it’s still a necessity, even if it costs more than we want to spend. When viewed against the long-term financial impacts of lost reproductive efficiency, added feed costs for one winter can be a solid investment. The income lost associated with a cow breeding back late or not at all can be tremendous. If a cow falls from early to late in the breeding/calving season, it is very difficult to back her up. The annual income she brings to the ranch will likely be permanently suppressed, because the calves she weans will be among the youngest and lightest for years to come. The longer breed-back is delayed the greater the financial impact will be. If she falls out of the season all together, you are faced with a lose-lose decision; sell a thin cull cow (for $0.55/lbs. +/-) or carry her for another year, with no return on investment, hoping she’ll breed next season. These scenarios can largely be avoided by carefully monitoring your cows and making the necessary investment to keep them at an acceptable Body Condition Score (BCS). Generally, it is cheaper to hold a cow at an acceptable BCS than it is to restore lost condition. Do what you can to keep them at or above a BCS 4. Evaluate your cows often and adjust your management based on what you are seeing. Be prepared to make a strategic investment now to help protect the long-term viability of the operation. When feed resources are scarce, it becomes even more important to allocate them as efficiently as possible. If possible, divide the herd into multiple management groups so extra nutrition can be provided only to those animals that need it. Group cattle according to nutritional demands and feed them accordingly. By basing feeding practices on nutritional demands, cow efficiency can be evaluated. If the whole herd is fed the same, animal performance (BCS) will largely be determined by the cow’s stage in the production cycle (open, lactating, gestating, etc.) not her actual feed efficiency. If further investment in nutrition is not possible, reducing herd size beyond normal annual culling is an option worth considering. In this scenario it is pertinent to be able to identify and cull the least efficient animals first. This will free up more resources to be utilized by the cows that will make the most of them, and leave a more efficient (albeit smaller) herd for the future. A less drastic option could involve weaning calves early to lessen the nutritional demand on the cows. This would potentially reduce income (selling younger/lighter calves) but could help protect the long-term reproductive efficiency of the herd. Recently, a good friend told me that “cows are slow money.” It was a good reminder that a cow herd is a long-term investment – an investment of time and finances – an investment that requires active management, even when we are tired and frustrated. Many of you have spent years putting together a herd that works in your system. Events beyond your control altered your systems – this year is just different. Manage your herd through these tough times, so they will still work for you in the future. As you are plugging along, it is important that you don’t let the tough situation that you are in now derail your long-term plans. If you need further explanation or assistance with any of the practices mentioned in this article (sorting cattle by nutritional demand, determining BCS, etc.) don’t hesitate to contact your county’s UF/IFAS Extension Agent.